During a signing ceremony, held this afternoon in the Princess Hejing Palace, Beijing, the Anchor Group and the China Europe Association for Technical and Economical Cooperation – European Union Working Committee (CEATEC EUWC) signed an official collaboration agreement. The strategic partnership between both organisations will include joint activities to promote EU-China trade to the benefit of their respective members, partners, clients and affiliates. By signing the agreement, the Chairman of CEATEC-EUWC, Mr. Pen Feng has become a permanent representative of The Anchor Group and member of its advisory board and Mr. Yannick Kalantarian, CEO of The Anchor Group and Mr. Ivan Hiel, President of The Anchor Group became official advisors to CEATEC-EUWC. 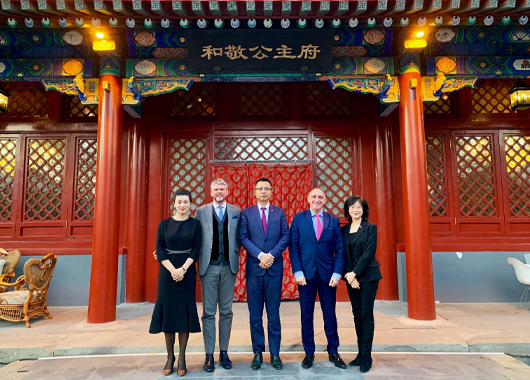 The fully restored 400 year old palace of the Chinese princess Hejing, serving currently as headquarters of CEATEC-EUWC, will house the Beijing offices of The Anchor Group. “This strategic partnership further strengthens the trade platform of The Anchor Group in China”, explains Ivan Hiel, “It brings a wealth of unique opportunities to our members and will facilitate further trading to and from China”. “We can now service our members interested in doing business with China both in Shanghai and Beijing”, adds Yannick Kalantarian. Priority will be given to strategic alliances between European and Chinese companies in the sectors of healthcare, agriculture and green technology.